Our teacher was a co-op mother for five years and was selected to become the teacher in 1996. She has a Bachelor's Degree in Education and specialized in Early Childhood Education. Her previous teaching experience was with a preschool in Denver, Colorado, where she taught for five years. The children are exposed to a wide range of educational experiences. The primary goal of the program is to create a safe, non-competitive environment in which the tots can learn and grow with their parents. A typical day begins with 5-10 minutes of circle time. We sing songs and talk about the days theme. The optional craft project is explained. The children then have about 30 minutes to choose from a variety of activities. The adult follows the child's lead offering support as the child begins to develop social skills. The school is divided into two large rooms. One is geared toward activities such as painting, crafts, puzzles, games, etc. The other room contains a large, walk-in dollhouse, workbench, climbing bar/slide structure, large wooden blocks and trucks, sand/water table, etc. The parent stays with the child in whichever area the child chooses. Next comes story/music and movement which often includes parachute play, bean bags or scarves. We end the day with snack. Because the tots meet just once a week, we do not plan many field trips. Holiday parties are held as part of the class. Language, Emergent Literacy, Phonological Awareness, Numbers (1-10), Shapes, Colors, Independent Thinking, Healthy Habits, Small/Large Muscle Control, Art, Creative Expression, Counting, Sorting, Positional Concepts, One-to-One Correspondence, Patterning, Graphing, Problem Solving, Socialization, Music, and Dramatic Play. A typical school day begins with fifteen minutes of circle time. The children sing or do activities to increase their language development and attention span. They are introduced to sign language and foreign languages. It is also during this time that children discuss important information occurring in their lives. Then the teacher explains the daily activities and gives directions for the day before they are dismissed. For the next hour the children are free to participate in a variety of activities. 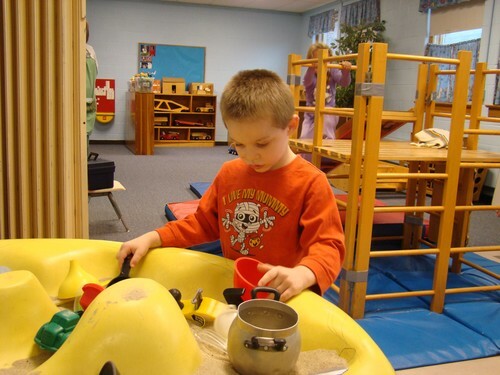 We believe this hour of self-oriented play is very important in the development of the preschool child. It is through play that children explore, discover, make choices, solve problems, socialize and acquire new skills. The school is divided into two large rooms. One is geared toward fine-motor activities such as painting, crafts, puzzles, games, etc. The other room contains equipment used in the development of large-motor skills. These include a large, walk-in playhouse, workbench, climbing/slide structure, large wooden blocks and trucks, sand/water table, etc. Next comes story time, which includes fingerplays, special stories, music and movement activities. The children also participate in activities that develop language skills, science, math, etc. The day ends with juice and snack. Beginning in October, the children usually have one special activity or field trip each month. Some of the field trips we have taken in the past include: the apple orchard, Sesame street Live, and Disney on Ice. In addition to these outside trips, we have special days at school. We have a day for the children to bring their fathers (or grandfather, uncle, or other special person) to school with them. There is also a day for siblings (or cousin, friend, etc.). Some of the other special activities include: color days, holiday parties, pizza day and teddy bear day. Every year our students embark on a special trip day. The classrooms are transformed to reflect the theme. Past themes have included safari, under the sea, outer space and the wild west.